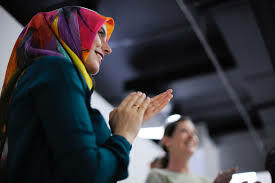 This is the woman in Islam who has an impact on the formation of his leg and the conduct of his accidents. He did not regard it as a germ that should be uprooted as in the ancient civilizations, and some other modernists consider it. Islam was the honor of women and it was decided by a woman to remove this disgrace. They have rights and duties, which are appropriate for their composition and nature. Islam recognizes that women and men in humanity, whether God said: "O people, I created you from male and female, and made you peoples and tribes, so that you may know that I will honor you in the sight of God." From the same one and created her husband and broadcast them many men and women. "The Messenger of Allah peace be upon him:" But women are the sisters of men. " What is the meaning of men's stewardship? The rule of man is based on what is specific to the honor of masculinity and the strength of the body and the breadth of the trick, which makes him guard women and his strength and defend them and spend on them, which earned his hands, the Almighty said: "They are like those who are good and men have a degree," that is the guardianship approved by Islam, It is well known from the religion that women must have only men in some exceptions, such as praying during menstruation, fasting Ramadan, and traveling around the house. , It is not permissible for them to do it to you only Majeure, and that Islam is equated between men and women in good reward, and reward savings and improve the degrees of Paradise. Islam has not distinguished between the treatment of mercy and fatherly affection between male and female, but called for absolute justice between them, the Almighty said, "Allah enjoins you with justice and charity." The Messenger of Allah (peace and blessings of Allah be upon him) said: "Be right among your children. Regarding the marital relationship: "The believers completed their faith and the best of them, and I honor them to his family and I am your best for my family." The case of ijtihad in matters that the nation has met is a kind of tampering with the religion of Allah. Some of these rulings, which are unanimously agreed upon by scholars, are necessarily known from the religion, and those who deny them are mistaken. It should also be noted that the rulings are based on the Book of Allah and the Sunnah of His Messenger (peace and blessings of Allah be upon him). The inheritance is one of the provisions that are detailed and clear in the Holy Quran, and can not be tolerated by diligence or consideration, including that the daughter of the deceased has half the son. The Almighty said: "The male has the same fortune as the two females." This rule does not apply to every man and woman in inheritance, The man is two daughters and a brother-in-law. That the sanctity of the marriage of a Muslim woman from a non-Muslim man is what is stated in the Holy Quran and the nation gathered upon him. Allah says (interpretation of the meaning): "If you teach them to believe, do not refer them to unbelievers. The Almighty says: "And you are like those who are good" shows that Islamic law is silent between men and women, while giving each party the right and obligation of duties.